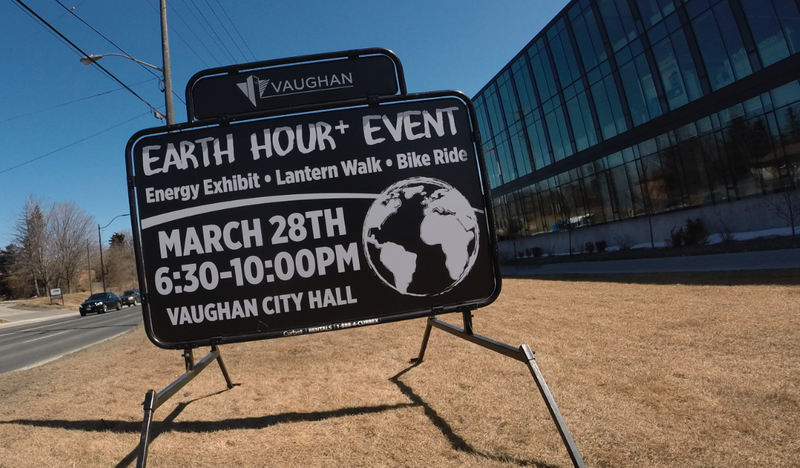 On March 28th, I participated in the Vaughan's Earth Hour event held at City Hall. 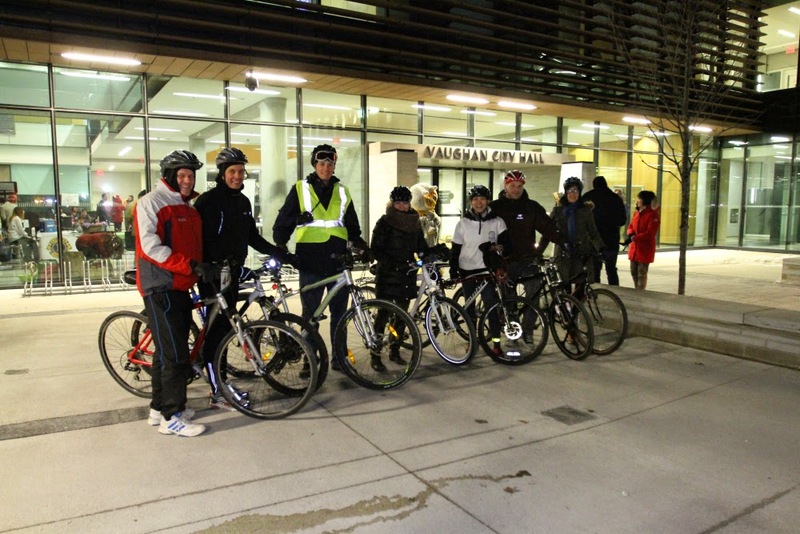 It included a night bike ride hosted by the City of Vaughan and Vaughan Bicycle User Group. The festivities included a energy conservation expo. Here's the Vaughan BUG table. 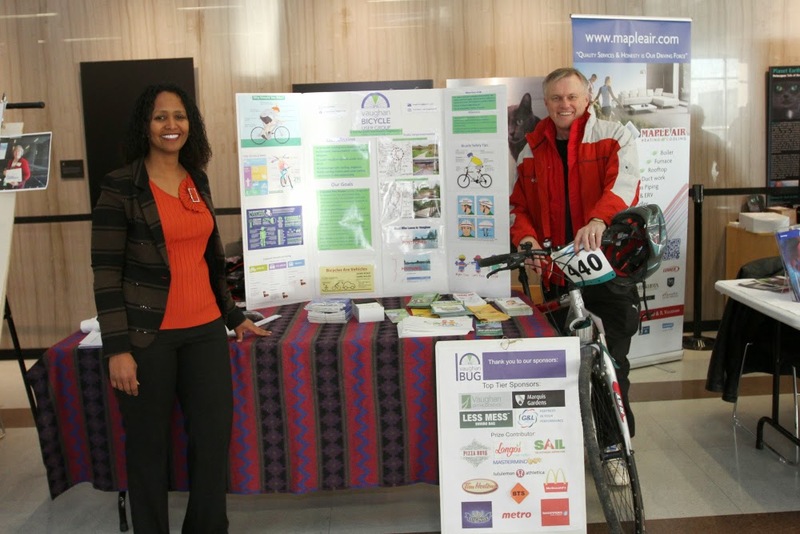 The group encourage residents to give cycling a try for commuting and recreation. People were asked to fill in the blank. "My Bike is My..." escape; fresh air; keeping fit; fun, etc. A bike is many different things to many people, and all of it makes life better. The 7 km bike ride offered a the opportunity for a group ride through the community, to socialize with other cyclists, and communicate that people in Vaughan do cycle. It showed that a night ride in March can be quite enjoyable, and is very commonplace in many cities. Cycling can be a year-round activity, even in our climate. 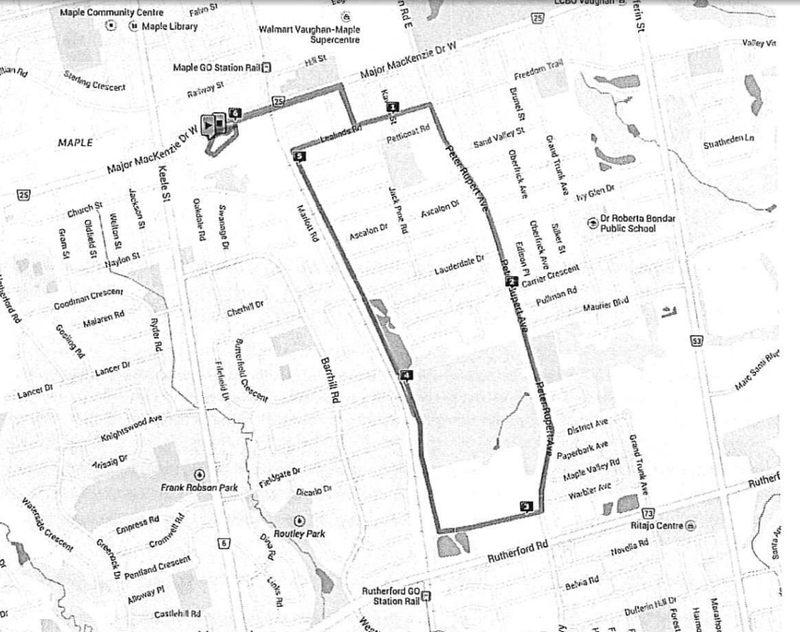 Here's the route, which started at Vaughan City Hall, went south on Peter Rupert (edge lines added in Fall 2014), west on Rutherford (paved shoulders), and north on a "Block 18" multi-use trail from Rutherford to Lealands Rd. Here's the route from a cyclist's perspective... part 1 is from Vaughan City Hall, to Peter Rupert & Rutherford. Here's part 2, from Peter Rupert & Rutherford, north on the trail along the CN/GO train corridor, and through the local neighbourhood back to City Hall. 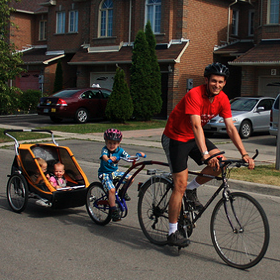 I hope the ride continues to grow, and that more Vaughan residents discover that cycling is a fun, easy, healthy, inexpensive way to get around and reduce their environmental footprint. Looks like everyone had lots of fun on the night ride! Great way to show people that it's not as daunting as one thinks. Curious though, the sidewalk near city hall on major Mac looks different than a regular sidewalk. Is it a multiuse path? the sidewalk near city hall is wider than usual because of the paving stones on either side. It's not officially a multi-use path, but works well as one.